Watches are a staple of our current busy lifestyles, as well as being the foundation of modern style and fashion. At Germani we cater to this need by providing you with our exclusive range of affordable, luxury watches for men and women. With a mind for timeless and elegant designs, each of our time-pieces have been meticulously crafted in Switzerland with ETA movement. You have a choice of designs made in stainless steel, with yellow, white or rose gold plating, with a mother-of-pearl face, a leather band, or with diamonds. 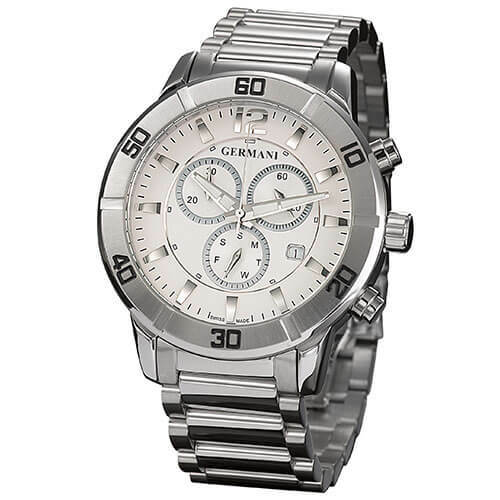 Whatever your style of watch, Germani will have a sophisticated time-piece suited to your needs.